15th Annual Mother’s Day Luncheon Tickets on Sale! The 15th Annual Mother’s Day Luncheon is scheduled for Friday May 10, 2019. Please join us for this beautiful luncheon and auction. It will be our largest fundraising effort of the year. This year we are returning to Le Chateau as it has been recently restored. Join us in this gorgeous setting on Friday May 10, 2019 at 11:30 for an afternoon to remember. Please click: www.mtflunch.givesmart.com to purchase tickets or to donate! Johnny’s Jog for Charity is inspired by the short but powerful life of Johnny Moran. Johnny was born with Wieacker Wolff Syndrome, a rare debilitating condition that affects the central and peripheral nervous systems. Johnny’s spirit of strength and love rose far above his many limitations. His positive attitude toward life affected all who came to know him. The goal of Johnny’s Jog for Charity 5K is to continue to share Johnny’s spirit by bringing the community together with a grand St. Patrick’s Day themed event benefiting 3 local non-profit children’s charities. Johnny’s Jog for Charity is a 501 C-3 tax exempt charity. We are very pleased to announce that we will again be offering 2 tickets to Hamilton in our auction at the Annual Mother’s Day Luncheon to be held on May 10, 2019. Please join us and do not miss a chance to experience the hottest show on Broadway while you are there!! Recently we were thrilled to provide a local CT girl with a specialized bike which will help strengthen her legs (and might be fun too!). Sami is an 18 year old who has had seizures since birth. 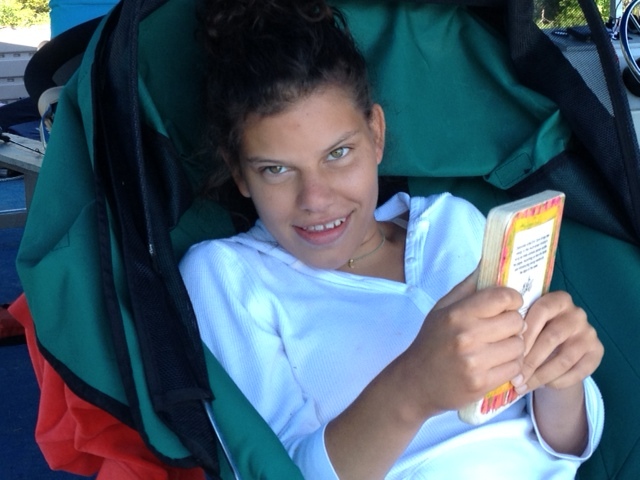 She is developmentally delayed and mostly non-verbal, but has a handful of words. She needs assistance with all aspects of daily living skills. Sa mi is mobile but over the past few years her knees have “collapsed” inward requiring physical therapy and exercise. The bike we purchased will be a highly motivational and effective way to strengthen Sami’s legs in the proper alignment.